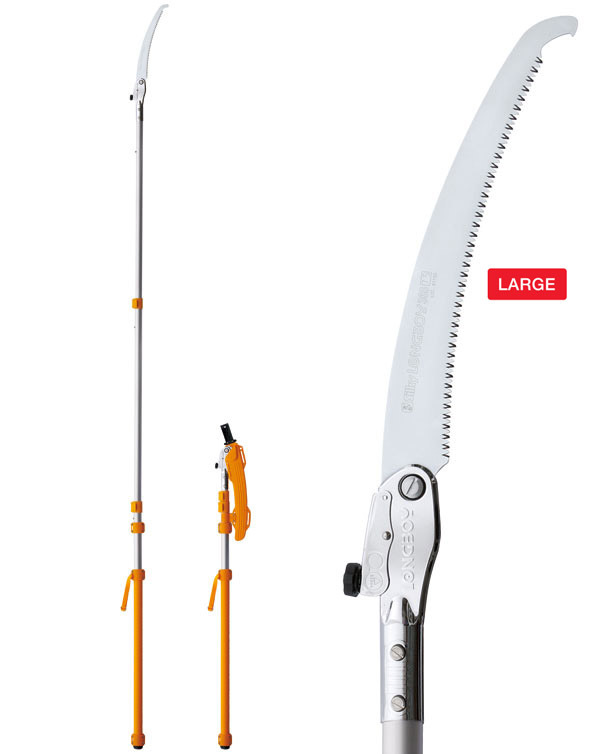 The Longboy Pole Saw has been developed as a pole saw with a permanently attached folding saw blade. This can easily be transported and stored as un-extended it is shorter than either the Zubat Pole Saw or the Forester Pole Saw. It is a lightweight telescopic pole saw with an oval shaped aluminium alloy pole which offers both strength and precise control. 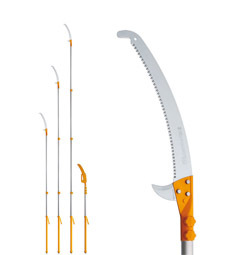 It can be used in a wide range of applications including trimming, pruning, gardening, forestry and arboriculture. 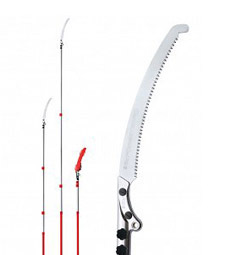 This lightweight pole saw can be used from the ground or climbed with to gain greater pruning range without the use of heavier, more cumbersome equipment. The bright yellow design makes it clearly visible. It is designed with two extension poles and offers an extension range of 1.45m - 3.60m. 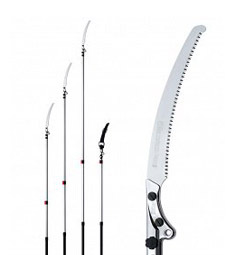 The saw has a curved 360mm blade with a mid-range teeth ratio of 7.5 teeth per 30mm. A yellow rigid-plastic blade guard is included, which locks onto the pole when folded for extra protection. The base poles have pole-end shock absorbers and a comfortable rubberised GOM over-grip which ensures good hold and control. 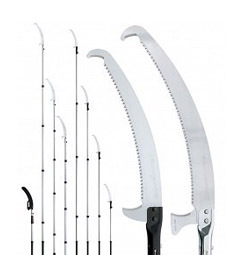 The base pole also has a wrist strap which can be attached at the top or bottom of the handle. This is designed to transfer the weight of the LongBoy Pole Saw to your bicep rather than your neck. Longboy blades cannot be re-sharpened due to the use of electro-impulse hardening in the manufacturing process. Replacement blades are available as are all other parts. To extend the Longboy Pole Saw, the clamps must be released and poles extended from the bottom up and closed from the top down. The Longboy Pole Saw should always be stored in the closed position with the blade guard in place. It should also be cleaned of any debris/dirt to ensure a smooth opening operation. The blade should ideally be cleaned with a solvent – this will help to prolong its useful life. The Longboy Pole Saw is telescopic and is constructed of aluminium alloy. The pole is lightweight and oval in shape which provides extra strength and rigidity and minimises bend when fully extended. This gives the user greater control over the direction of the blade when cutting. This Silky Saw is manufactured from SK-4 carbon steel and cut out by laser. The taper-ground profile reduces drag and directs more usable energy to the cutting edge. In addition, the 'non-set' design teeth means they are formed inside the width of the blade – this reduces friction and enables a cleaner, faster and easier cut. Many other saws have teeth formed to project outside the width of the blade requiring much greater effort when sawing. The manufacturing process also uses the technique of high-frequency electro-impulse hardening during which the teeth are heated and hardened. Importantly, only the teeth are hardened, not the rest of the blade. Thus the blade retains its original flexibility whilst the teeth have a life which is up to three times longer than that of standard saws. The blades on the Longboy Pole Saw are also chrome plated which helps protect against rust and sap as well as providing additional strength. This also helps extend the life of the blade.